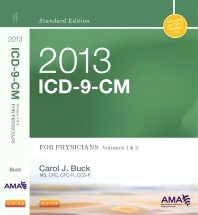 Learn to code more efficiently and effectively with Carol J. Buck’s 2013 ICD-9-CM for Physicians, Volumes 1 & 2 — Standard Edition. Combining Netter’s Anatomy artwork and the Official Guidelines for Coding and Reporting (OGCR) with a format designed by coders for coders, this handy reference helps you easily access the information you need to stay up to date and ensure the most accurate billing and optimal reimbursement in physician-based coding. Plus, you can take this resource into your certification exams for enhanced testing support! Exclusive focus on ICD-9-CM, Volumes 1 and 2 provides clear, concise coverage of physician-based and outpatient coding essentials. Symbols throughout the text alert you to new, revised, and deleted codes and clearly identify codes that require special consideration before assigning symbols, including Not First-Listed Diagnosis, Unspecified Code, Includes and Excludes, and Use Additional. Omit and Code First codes highlight government text needing special attention.